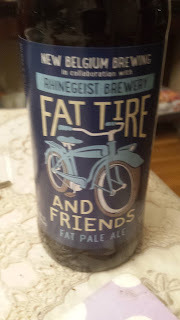 This week's Sunday Night Suds looks at another of the Fat Tire & Friends' offerings - Fat Pale Ale. This summer New Belgium celebrated the 25th anniversary of Fat Tire by collaborating with other notable breweries and producing their ode to Fat Tire. The Fat Tire and Friends mix box contains five beers in addition to Fat Tire itself, including: Fat Funk Ale; Fat Hoppy Ale (reviewed here http://kosherbeers.blogspot.com/2016/09/sunday-night-suds-new-belgium-fat-hoppy.html); Fat Pale Ale; Fat Sour Apple Ale (reviewed here http://kosherbeers.blogspot.com/2016/08/sunday-night-suds-new-belgium-fat-sour.html) and Fat Wild Ale.While this would be exciting to most beer aficionados, it is even more exciting to the kosher beer consumer since all of these brews were produced at New Belgium and the 12 pack box even has the Scroll K (Va'ad of Denver) symbol on the bottom of the box. The Fat Pale Ale was produced in collaboration with Rheingeist Brewery. It has a mix of citrus, with some lemon and coriander notes, but a fair amount of malts as well. The beer is a little high on the alcohol content (6% abv) but the flavor does not manifest in the brew. There was some pine, but did not taste like a traditional American Pale Ale. I could see pairing this beer with saucy chicken or even grilled chicken dishes. If you had a good pairing experience, please post it in the comments below. Please note that not every brew produced by New Belgium is under kosher supervision. For a list of the New Belgium brews currently under supervision, please click on the link on the left side of my home page for my latest Kosher Beer List. To see what the experts on Beer Advocate think about New Belgium Fat Pale Ale, please follow this link beeradvocate.com/beer/profile/192/217619. As always, please remember to drink responsibly and to never waste good beer unless there is no designated driver.